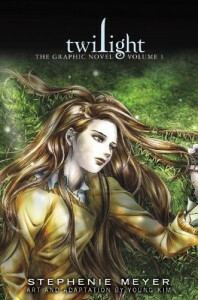 Whatever you may think of the Twilight Saga, books or films, the graphic novel is a very different experience. I spent half of the time studying the wonderful artwork, and Bella's incredible ability to do a new wondrous thing with her hair every day. My only gripe, that unfortunately stopped me loving this edition of the story, is the panels dotted throughout the volume where the artist supposedly got a bit bored, rushed or just lazy, and stuck some hastily photoshopped photos in as backgrounds, or (worse still) expanded a small section of an illustration for a close up that teetered precariously on the edge of pixelisation. If not for these 'arisitc' decisions I would be wholeheartedly in love with this work, being otherwise a very high quality and well produced edition.